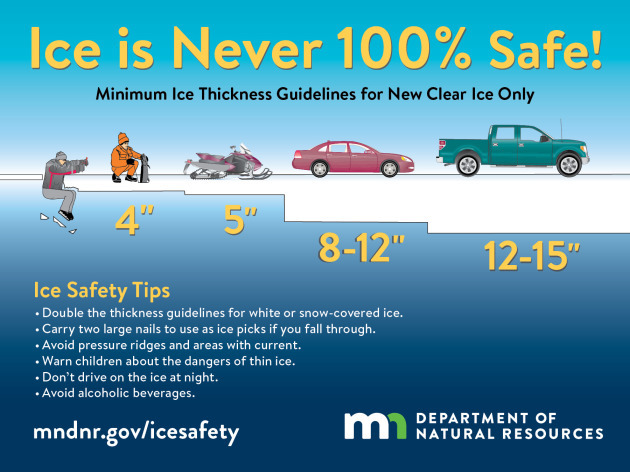 "We're still on track for a few inches of snow Friday across southwest and southern Minnesota. A winter weather advisory is in effect. The snow will begin Friday morning, and end late Friday evening. Expect slippery roads and slow travel." A storm system moving through the Central US on Friday will skirt the MN/IA/SD border with areas of snow as far north as the Twin Cities, but accumulations should be confined to far southern MN and especially near the MN/IA/SD border. Here's the snowfall potential through 6PM Saturday, which suggests a few inches of snow possible across the southern part of the state with shovelable amounts south of the Minnesota River Valley and closer to the MN/SD/IA border. It is definitely way too early to tell what may happen as we slide into the early part of next week, however, extended model runs continue to keep an active weather pattern across the region. 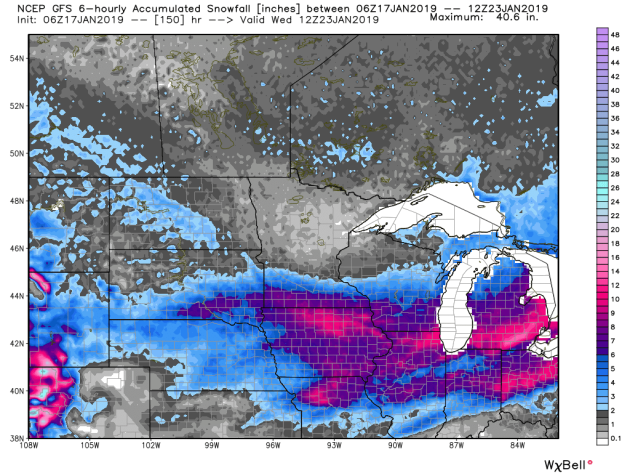 Here's a look at the GFS (American model) snowfall potential through Wednesday of next week, which suggests areas of heavier snow possible across the southern part of Minnesota once again. Stay tuned! An upper-level system - currently responsible for heavy rain and snow in the western United States - will help develop a new area of low pressure in the Plains late this week. This system will bring the potential of heavy snow and ice from the Plains into the Ohio Valley and into the Northeast from late in the week into the weekend. Already Winter Storm Watches have been issued across parts of the Northeast - including Boston - for the heavy snow and ice potential. Active Weather Out West. Heavy rain and snow – as well as blizzard conditions – have been occurring out in the western United States with a landfalling storm system. Blizzard Warnings are in effect across parts of the Sierra through the morning hours with Winter Storm Warnings continuing into early Friday due to total snowfall of 3-7 feet and wind gusts up to 100 mph. Numerous Flood Watches are also in effect, especially across burn scar areas as flash floods and debris flows will be possible due to heavy rain of at least 1-2” in spots. Storm Moves East Late This Week. The same system responsible for the active weather out west will move east over the next few days with an area of low pressure developing in the Plains Friday. This will bring snow to parts of the Plains to end the week and begin the weekend, with snow and ice spreading into the Mid-Atlantic and Northeast this weekend. The snow on Friday across parts of the Northeast is with a different, weaker system impacting the region. 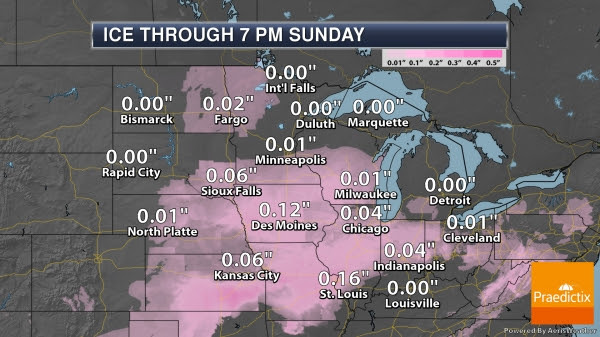 Pierre, SD: Winter Storm Watch in effect from Midnight tonight to 6 PM Friday for 4-6” of snow. Sioux Falls, SD: Winter Weather Advisory in effect from 3 AM Friday to Midnight Friday night for 3-6” of snow. Omaha, NE: Winter Weather Advisory in effect from Noon Friday to 6 AM Saturday for 2-5” of snow. Des Moines, IA: Winter Weather Advisory in effect from Noon Friday to 6 AM Saturday for 4-6” of snow. Buffalo, NY: Winter Storm Watch in effect from 1 PM Saturday to 6 PM Monday for the potential of at least 7” of snow in combination with this upcoming storm system Saturday into Sunday as well as lake effect snow behind the system Sunday afternoon into Monday. Syracuse, NY: Winter Storm Watch in effect from 1 PM Saturday through 4 PM Sunday for the potential of 12-20” of snow. Albany, NY: Winter Storm Watch in effect from 4 PM Saturday through 7 PM Sunday for the potential of at least 9” of snow. Boston, MA: Winter Storm Watch in effect from 4 PM Saturday through 7 PM Sunday for the potential of at least 6” of snow along with ice accumulations of up to fourth-tenths of an inch. Portland, ME: Winter Storm Watch in effect from 7 PM Saturday through 7 PM Sunday for the potential of at least 6” of snow. Snow Potential. 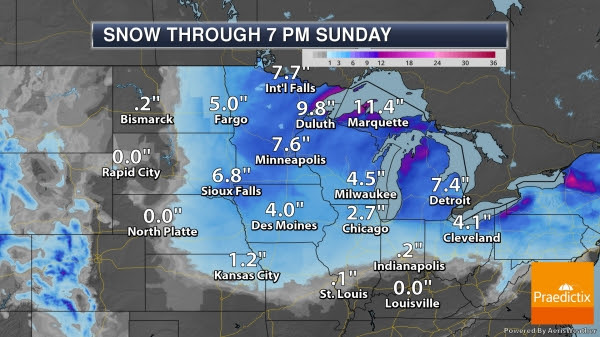 While an inch or two of snow will be possible over the next 24-48 hours across parts of the Ohio Valley into the Northeast with a different system moving through the region, a bulk of the snow shown on the Northeast snowfall maps will fall with the larger system expected to move through the region this weekend. In the central United States up to a half a foot or more of snow will be possible in some locations as this system moves through. 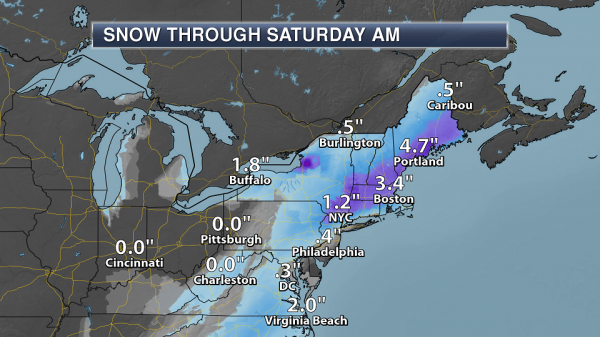 In the Northeast, some parts of the region could see over a foot of snow through the weekend. Note that as typical with these types of systems small changes in the path could change expected impacts for some areas. There is also uncertainty as to how far south the heaviest snow will fall due to differences in the models with regards to the extent of warm air and how fast the system moves through the region. All of this will help determine snowfall totals, especially in areas like New York City and Boston, and are issues that we will have to keep a close eye on the next few days. Ice Potential. Another major impact with this system will be ice. While there is also uncertainty as to the where the greatest ice potential will be, it does appear likely that parts of the Northeast could see between at least a tenth and a quarter inch of ice from this system. Further back to the west, parts of the Ohio Valley could see up to about a tenth of an inch of ice through Saturday evening. Happy Friday and happy National Winnie the Pooh Day! Yes, there's a day for that... Today I am reminded by one of his famous quotes and especially this soon after the holiday season: "I am short, fat and proud of that." Sure, I probably had one too many cookies in December and my bewitching 5 foot 5 inch frame will still never be able to slam dunk a basketball over Larry Bird or Kevin Garnett, but that's ok! A strong Pacific storm recently dumped 5 to 8 feet snow across parts of California's Sierra Nevada range - unreal! 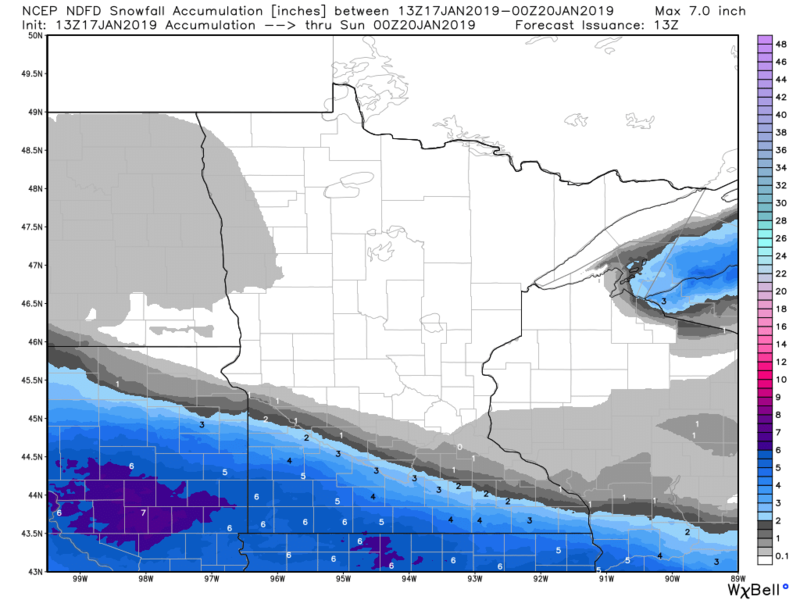 A piece of that system will track across far southern Minnesota today with some shovelable amounts along the South Dakota and Iowa border, but the Twin Cities will get missed again! 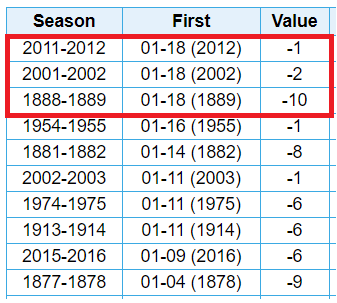 If you're keeping track, MSP is nearly 17 inches below average for the season. Last year at this time, we were nearly 16 inches below average for the season and we all know what happened in April - GULP! The weekend will be cold, especially up north. 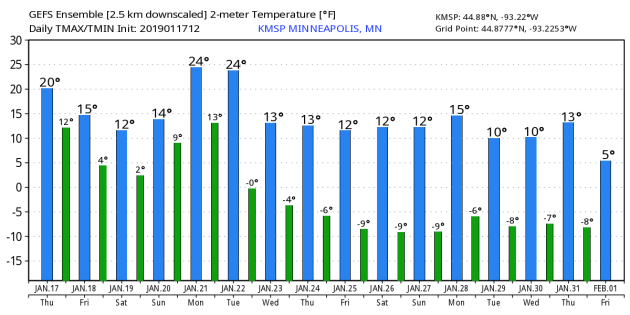 Hockey Day Minnesota fans in Bemidji will need extra layers Saturday - BRR! FRIDAY: Light PM snow, heavier south. Winds: NE 5-10. High: 13. FRIDAY NIGHT: Light snow, then mostly cloudy. Winds: NNE 5-10. Low: 3. SATURDAY: Bright & cold for Hockey Day Minnesota. Feels like -10F early. Winds: NNW 5-10. High: 11. SUNDAY: Quick clipper. Minor coating possible. Winds: SE 5-10. Wake-up: 2. High: 12. MONDAY: Snow accumulations overnight. Winds: ESE 5-10. Wake-up: 8. High: 22. 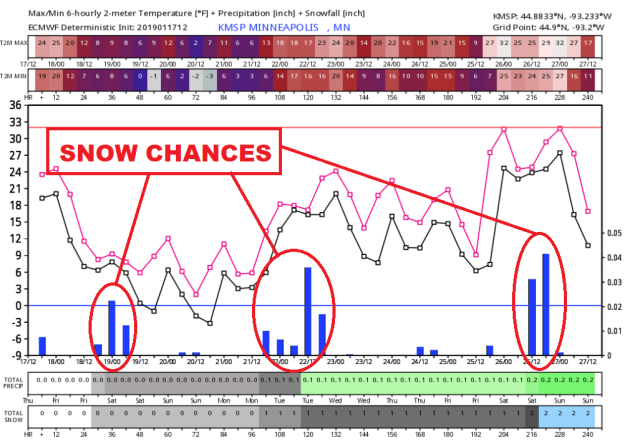 TUESDAY: AM flurries. Cold wind. Winds: NW 10-15. Wake-up: 14. High: 20. WEDNESDAY: Sub-zero wind chills. Few flurries. Winds: WNW 5-10. Wake-up: 0. High: 10. THURSDAY: Another cold one. Extra layers needed. Winds: N 5-10. Wake-up: -2. High: 10. 1996: A blizzard begins across the upper midwest. The Twin Cities Airport was spared the heavy snow, but received nearly one inch of rain. 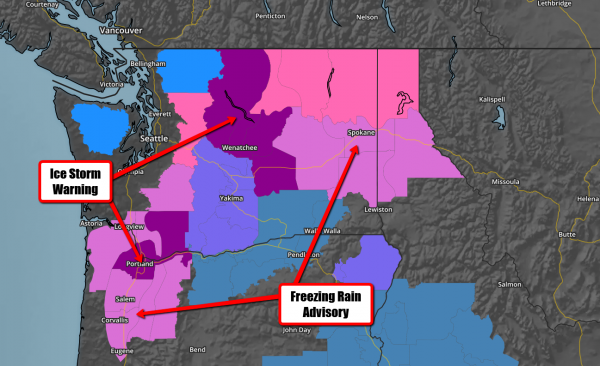 Heavy ice coating in the northwest metro area caused thousands of power outages. 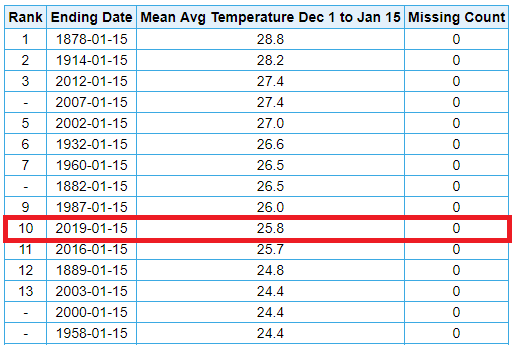 Wind chills were as low as -88 (on the old windchill scale) at Crookston. Snow totals were 18 inches at Ely and 12 inches at St. Cloud. Mail delivery was stopped for the day in Duluth and I-94 was closed all day from Rothsay and Moorhead. Flooding problems were caused in the Twin Cities due to backed up water. 1994: Governor Arne Carlson orders all Minnesota public schools closed due to the extreme cold and severe winter weather. Morning readings were in the 30-below-zero range. The biggest problem was from high winds that came with the cold. "Tonight – January 18, 2019 – our chart covers an area of sky wider than we typically show. It’s in answer to a reader in Nashville, who wrote: We can do better than that. We can advise you to go outside on this date, and look for the waxing gibbous moon, then notice the stars nearby. The moon is within the Winter Circle stars on this date. All the stars of the Winter Circle (sometimes called the Winter Hexagon) are first-magnitude stars, so they should be able to withstand tonight’s drenching moonlight. The Winter Circle stars don’t form a perfect circle … is anything ever perfect? Try starting at Capella and moving clockwise to Aldebaran, Rigel, Sirius, Procyon, Pollux, and Castor. This pattern of stars is not a constellation. It’s a lot of separate stars in different constellations. In other words, it’s what’s called an asterism. From our Northern Hemisphere locations, these same bright stars can be seen before dawn every late summer and early fall. And they can be seen in the evening every winter. Hence the name Winter Circle. I wonder what these same stars are called in the Southern Hemisphere? They’re visible from there, but of course it’s summer there now. I don’t know if this particular collection of bright stars has some special name as seen from that part of the globe. If any of you do know … tell us in the comments!" High temps across the country on Friday will still be warmer than average across muhc of the nation with the exception of the Upper Midwest and those along the Front Range of the Rockies.